Dr. Sun Yat Sen (originally named Sun Wen) was the great forerunner of the Chinese Democratic Revolution. He was well known as the Founding Father of the Republic of China by Chinese. Dr. Sun was born on Nov 12, 1866 in Hsiangshan county of Kwangtung Province and passed away of illness on Mar. 12, 1925 in Peking. Dr. Sun received his early education in Honolulu (Hawaii), as he went to Honolulu with his mother to join his borther in 1879. Dr. Sun returned to China in 1884. He entered the College of Medicine for Chinese in Hong Kong in 1887, and he gradurated in 1892. He worked as a doctor in Maucau and Hong Kong. He found that the social and political situation of China had fallen into decay in the later 19th century. He suggested to Li Hung Chang of Qing government for political reformations in 1894, but Li refused his suggestions. Later he engaged in revolutionary activities for national salvation in Canton. He founded the Hsing Chung Hui (Society for the Revival of China) in Honolulu in 1894. He was elected as president of Tung Meng Hui (Chinese Revolutionary League) in Tokyo in 1905. Though the League had organized many times of uprising in southern China, all uprisings failed. In 1911, Dr. Sun issued abroad the gold standard currency of the Republic of China to raise funds for the revolutionary activities in China. Dr. Sun returned to China after the successful Wuchang Uprising in 1911. Dr. Sun was elected President of the Provisional Government on January 1, 1912 in Nanking and the Republic of China was established. 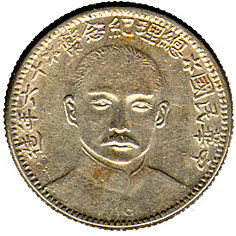 This silver coin was minted by Fukien Mint in the 16th year of the Republic (1927) in order to commemorate Dr. Sun's deeds during the revolutional period. Same kinds of coin have the denominations of 2 Jiao (20 cents) and one Jiao (10 cents). The obverse of this coin bearing the portrait of Dr. Sun Yat Sen and 13 Chinese characters above meaning "The Republic of China", "Coin commemorative of the Premier" and "Minted in the 16th year". The characters are interspersed with floral stars. 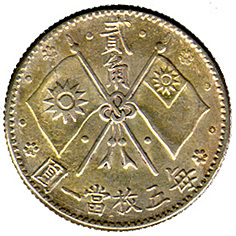 On the reverse are bearing with two crossed republican flags in the centre, and 2 Chinese characters above and 6 Chinese characters below denoting the denominations of 20 cents.